Previously I made a page for my cousin Alicia using MOXXIE's Paws N Claws line. The line features cats & dogs and yet I made it neutral. I wanted to try it again, but this time using the cat theme. 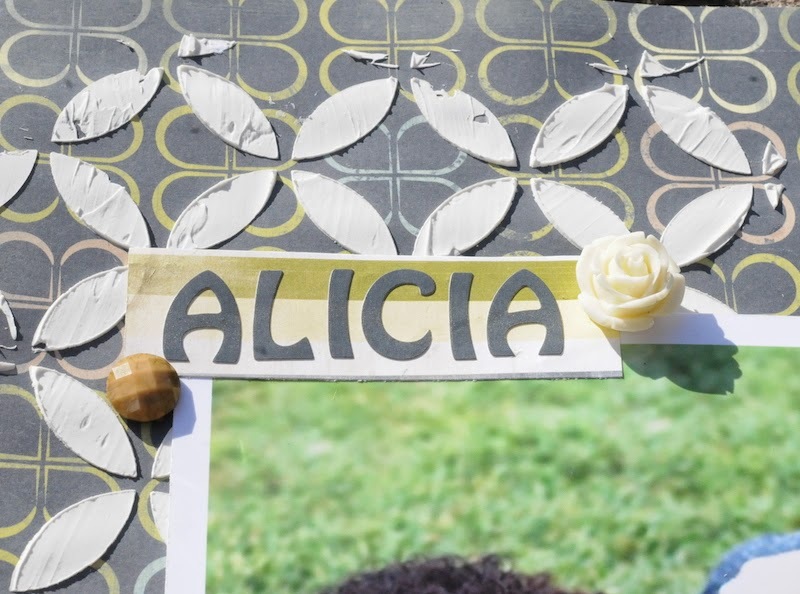 I used another pic of my cousin Alicia for her graduation album. This pic came from her Facebook page (love that kids post stuff for us to use now a days). This playful pic of her with kitty whiskers and nose just begged for the Paws N Claws line. Look how great the rub-on of the kitty is (these are high quality rub-ons unlike SOME that bite). And for a little fun touch, I had to add a cat scratch. To create, I cut with an Exacto Knife then just wiggled and wiggled the knife in the cut to rough it up and give it distressed definition. Although I grew up in a house full of sisters, my little family now is mostly boys- one hubby and two sons. So my scrapbook pages which prominently feature them also showcase a masculine slant. But when I get a chance to go girly, I really like to layer it on. My cousin Alicia is graduating from High School this year. What a lovely young lady. Look at those eyes! I scrapped this page for her mom. When I saw the beautiful green of the grass contrasted with the grey of her sweater, it inspired me to use MOXXIE Paws 'n Claws also in grey and green. Now, that paper line is all about cats and dogs you say? Well look how sophisticated the line is when you dress it up with a few flowers. Not a pet in sight. Plus the argyle reminded me of a school girl print, just right for a school girl. First I wanted to bring the boldness of contrast with some black and white onto the page- so I used the Heidi Swapp Circle Lattice Spray Stencil. 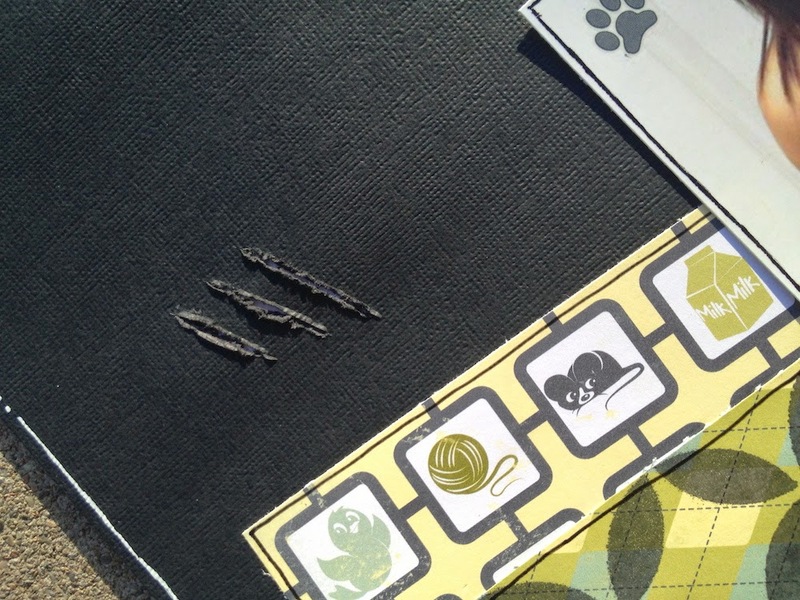 First I sprayed black mist on Catnip paper which looks like a school girl argyle, perfect for a pic of a school girl. Then I spread white modeling paste in opposite corners of the Tangled paper. Now when spreading the modeling paste, I wasn't concerned about perfection or trying to stay perfectly in the lines. 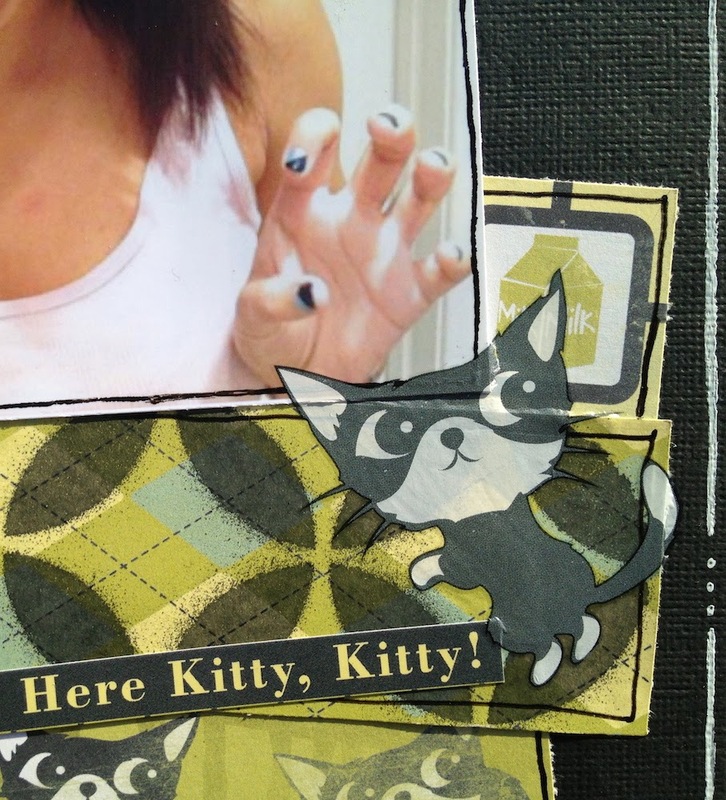 This is scrapbooking- enjoy. Get messy. Just go for it. Then for the flower and button clusters. 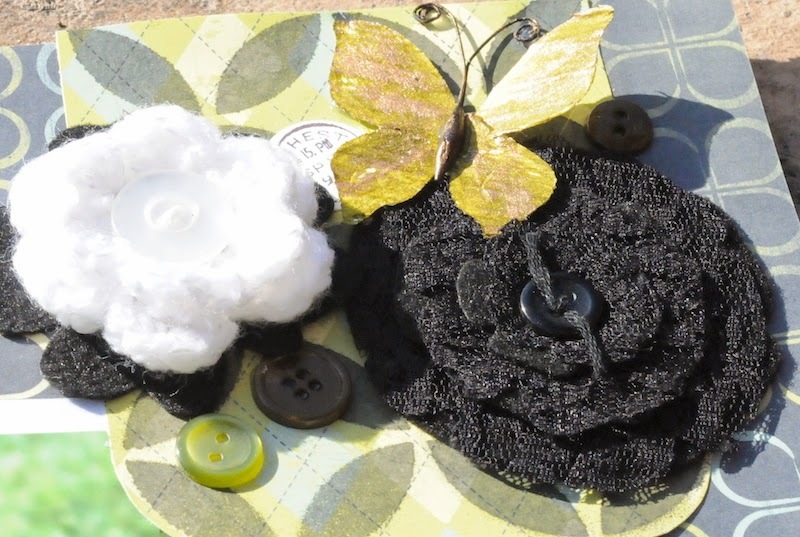 I included felt and card stock flowers, paper flowers, lace flowers, hand crocheted flowers and even a resin flower. The mix of textures on the flowers adds extra interest. Add some fun buttons and I have a bouquet of beauty balanced on opposite sides. The Kitty Stickers include alphas that I used to title the page with her lovely name. I'm partial to that last name of Silverthorn, since it is my maiden name. The thing to take away from this page is even if there is a strong theme to a page, you can always customize it and make it your own. Add a bit of mixed media or layer on embellishments and it is what you make it. Of course, starting with a great base like Moxxie helps too.